It’s no secret that there’s a shortage of quality books addressing the topic of fundraising operations (also called development or advancement services). This book is a welcome relief to this shortage. 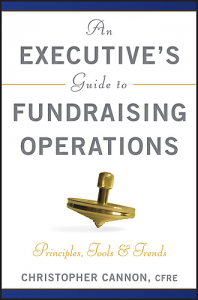 An Executive’s Guide to Fundraising Operations: Principles, Tools & Trends (The AFP/Wiley Fund Development Series) fills the gap nicely with a well organized and well researched text. This book isn’t just another “how-to,” but includes perspectives from the field in the chapter titled “Decision Advice from the Field.” These contributions from practitioners in the field help bring additional context to the terms, concepts, and examples showcased elsewhere in the text. I believe this book of great value, not just for the non-profit executive manger as the title suggests, but also for front line fundraisers. Regardless of your position in the organization, this book will help you better appreciate the theory and application of effective fundraising operations and will help you better utilize this organizational asset for accurate and timely information and help ensure donor satisfaction and retention.